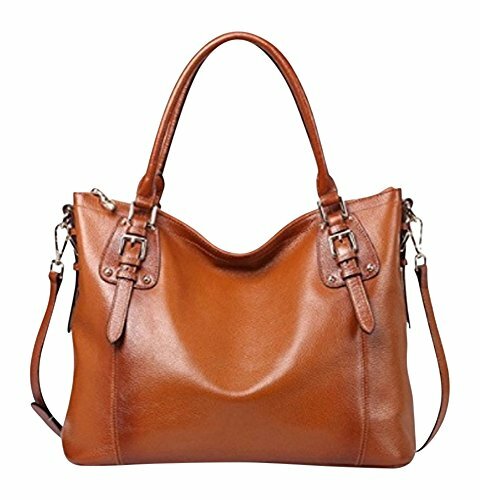 100% Brand New soft and beautiful shoulder or cross-body tote bag with detachable shoulder strap. Made from high quality imported vintage waxed genuine cow leather with durable gold colored hardware to complement business or casual wear and usage. Made from soft cowhide leather. High quality durable gold-colored hardware. Great leather bag for work, school, play or travel. Detachable shoulder strap and comfortable handles for hand carrying. Durable yet soft leather exterior in neutral colors to match business to casual fashion. Dark brown interior polyester lining. Two large interior pockets, which also has another pocket for cell phone and another small zippered pocket for personal items. Easily carry a smaller laptop, files, mobile phone, wallet, cosmetics, tablet, umbrella and other daily take-along items. Zippered closures for main compartment and zippered side pocket for added security. The outside pocket is conveniently located to quickly store smaller goods, such as cell phones, lipstick, and other miscellaneous items. Fits up to a 14 inch laptop in most cases, in addition to wallet, cell phone and other miscellaneous items. If you have any questions about this product by Olivia, contact us by completing and submitting the form below. If you are looking for a specif part number, please include it with your message.